Are you slipping over takeaway menus and flyers every time you open the door? Junk mail is a nuisance for many homeowners and it’s also a big contributor towards waste with many flyers, leaflets and magazines going straight in the bin. 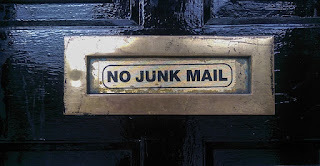 So what’s the best way to deal with junk mail and put a stop to it? Be careful what you sign up for. One of the biggest contributors to junk mail is online sign-ups. This is when you are filling out an online form and you tick a box to say that you are happy to receive communications from the company in question. They then use your address to send you marketing material that in all honesty you probably never wanted. The best way to deal with this is to be very careful when you fill out online forms, purchase items online or enter competitions. The forms can often be misleading, or you might fill out a form in a hurry but try to be vigilant if you want to cut down on your mail. One physical tactic that you can use to cut down on junk mail is to display a sticker in your window which specifically prohibits junk mail. However, while this might cut down on unsolicited mail you will still receive letters that are specifically addressed to you. So, car washing flyers and kebab menus are less likely to be delivered but you may still have some letters to open. The Mailing Preference Service (MPS) is a free service set up 20 years ago by the direct mail industry to have their names removed from industry lists. Backed by the Royal Mail, signing up can have your name removed from 95% of direct mail marketing lists. Finally you can also inform the Royal Mail of your anti-junk mail stance. By calling them on 0345 266 0858 or emailing your name and address to optout@royalmail.com they will note down your preference. Here at LSPS recycling is of great importance to us and we help businesses and individuals all across Leicestershire to reduce the amount of their waste that ends up at landfill sites. Our Waste Transfer Station is open to traders and has an extensive range of state of the art equipment. To find out how about we can help with your waste disposal needs please contact us on 0800 083 7807, or visit our website for further information.